Hey there peeps! I’m dropping in to share what I think is the funnest summer card I’ve ever created. I mean it’s got a smiling strawberry..what could be more fun than that? These bright and cheerful colors just makes me so happy. 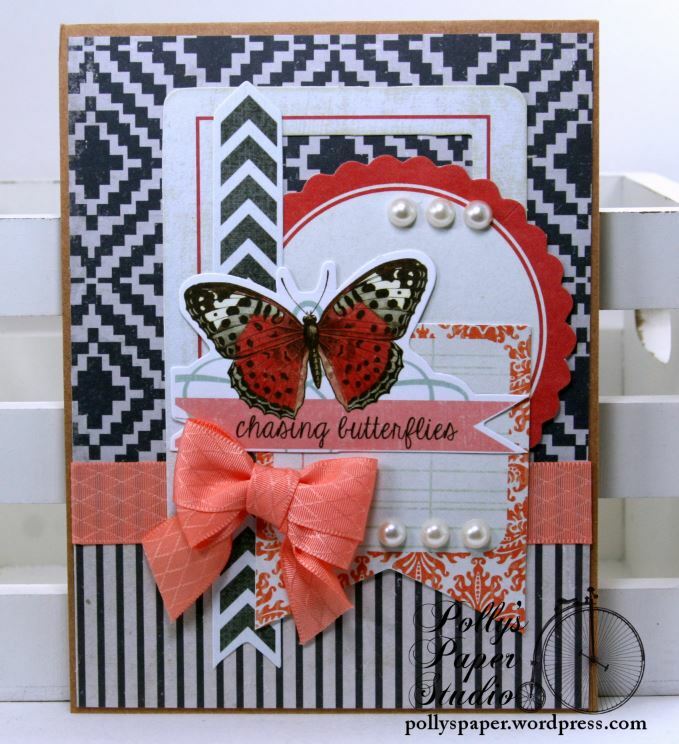 Polka dot and chevron striped ribbon trims are the perfect choice. Inside the card is finished off with a coordinating stripe. I turned a cut apart into a tag by clipping of the corners and adding a metal eyelet with twine. I’ve also tucked in a metal rimmed mailing tag and loads of yummy flowers. Many spacers between the layers for a nice dimensional look. The die cut doily in the back helps to break up the busy patterns. Really Reasonable Ribbon Supplies~ Chevron Striped Twill in Red, Burlap String Ivory, 3D Foam Tabs. Petaloo~Botanica Baby Blooms Red, Chantilly Velvet Hydrangeas Red. We’re kicking off the summer holiday season with a fabby new Stars and Stripes Patriotic Creativity Kit!!!! So many festive paper patterns, vintagy images and prettied bows. Of course I got into one and whipped up some projects…because that’s what I do lol. I have created 2 full sized cards, 2 large tags, 2 house tags (my favorite), and 2 wall hangings. There is a good sized stack of leftovers too so I can create some tags and labels for home made goodies for the holiday. OMGoodness you guys I love all these projects. 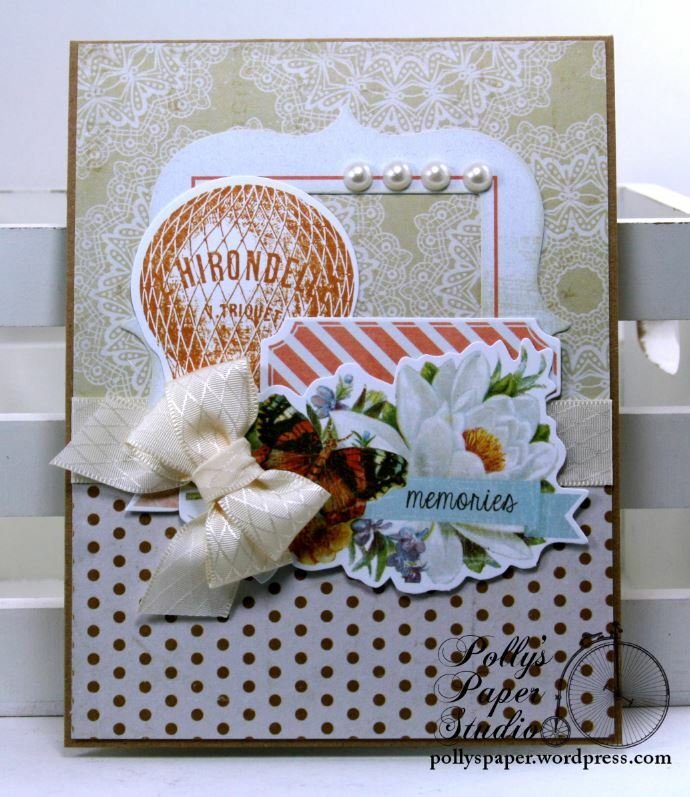 I started with the kit and added cardstock and bits and pieces from my stash. I admit I did dye my hands blue and glue myself to the table….but hey it’s all part of the process right? 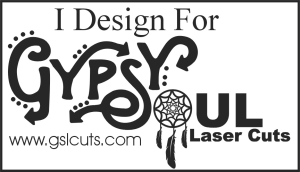 Gypsy Soul Laser Cut Chipboard~ Stars & Flourishes Border and Corners Set, Photo Reel, Tulip Scroll Corner, Scribble Frames and Lines. Really Reasonable Ribbon~ Burlap Center Stitch Navy, Chevron Striped Twill Light Blue, Tiny Electric Blue Stars on Grosgrain, Shimmer Satin Blue, Satin with Stitched Center Navy. Petaloo~ Briar Rose Canvas Red-Blue, Textured Elements Canvas and Burlap Daisy Blue. Hey there Peeps! 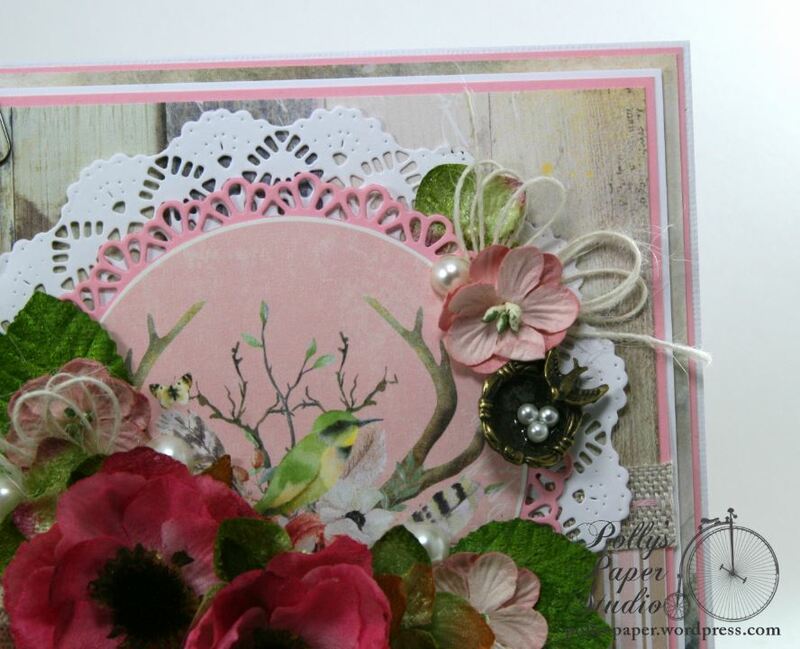 Ginny here to share a very springy and just a little bit vintage and shabby all occasion greeting card. 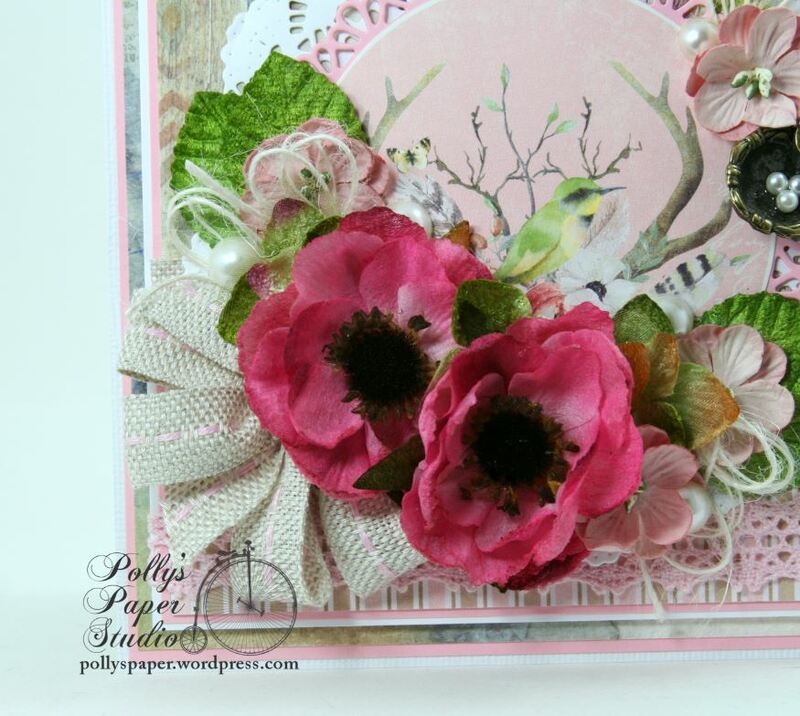 The inspiration was a lovely bird image with coordinating pattern papers that just called out to have a garden of flowers added to accent it. I just love the soft pinks and wood grain together. I added a white die cut doily to brighten it up just a bit. Multiple layers of matting helps to separate the patterned papers and provide a sturdy base to add oodles of gorgeous flowers. 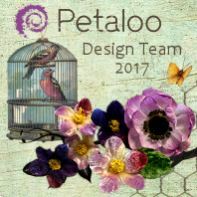 Petaloo has so many lovely flowers that it’s very easy and fun to match up blooms to your projects. Tucked in under more flowers at the top is a sweet little bird nest charm with pearly accents because cards need a little bling to be extra awesome. 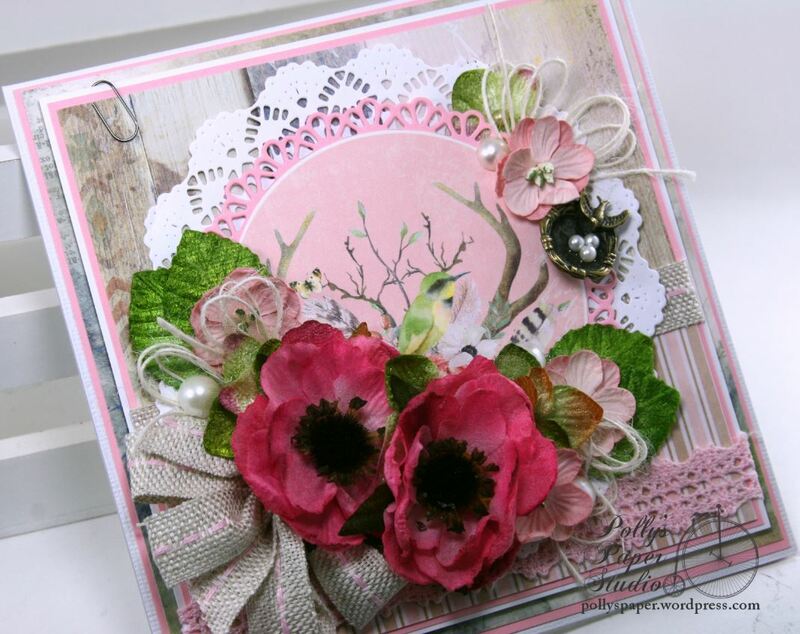 Since this card turned out to have such a lovely nature inspired look I added a bow created with burlap and a little border of pink lace. Hey Peeps. Well I’m going CAS today. I know..it surprised me to. When I got my supplies out to create cards all the fun little images and die cuts just fell into place and I thought why not? Everything doesn’t need to have flowers and chippies and embellies. Sometimes you just need a quick card that’s good for any occasion that can be mailed in a regular sized envelope right? Hey there Peeps! 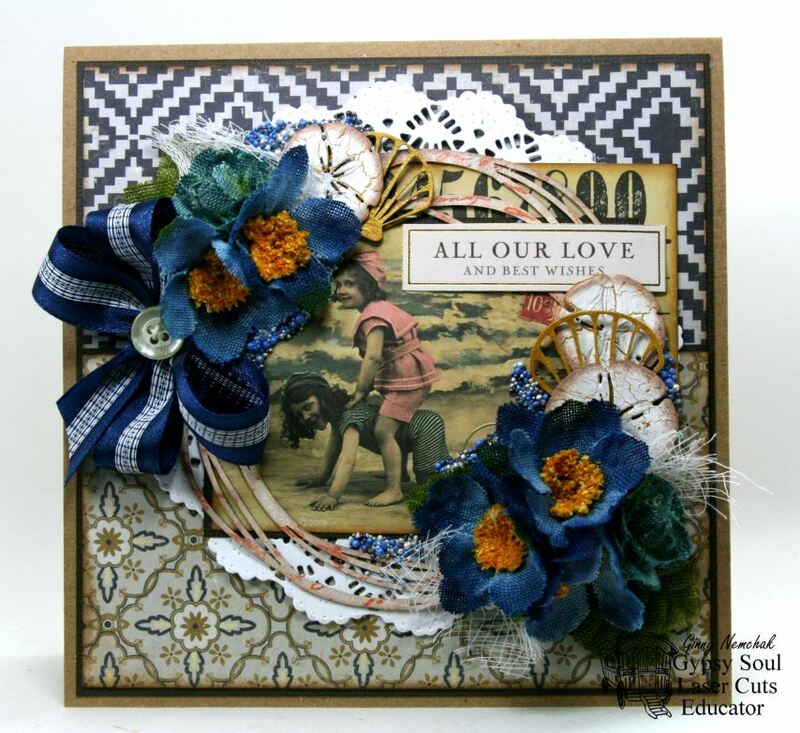 I’m sharing a card today with a vintage beach theme that is near and dear to my heart. Our little family loves the beach so much we spend our Christmas holiday there. A little sand….a little surf. IHOP(for those not in America IHOP is International House of Pancakes) for Christmas dinner. What could be better? 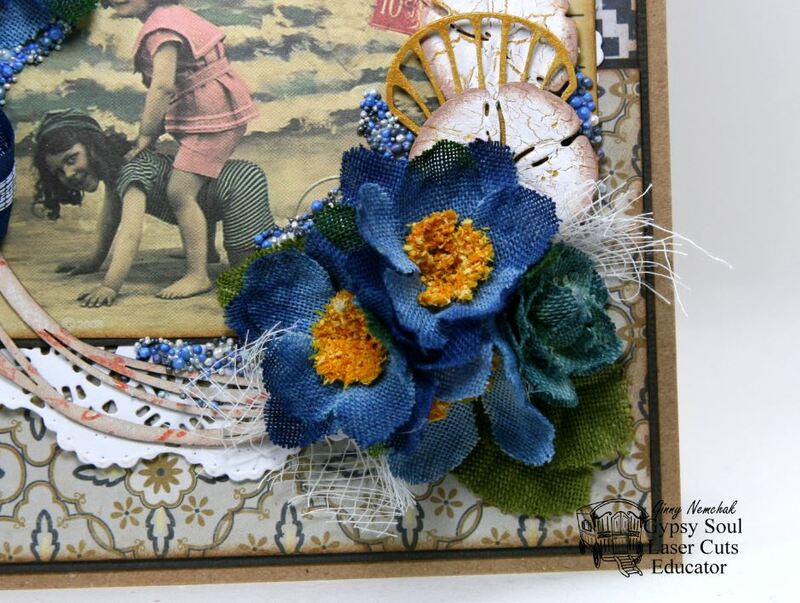 I think these warmer tones of blue and kraft adds to the vintagy effect. The shells and sand dollars make a great accent and work well to fill in the flower arrangement. A scribble frame in a circular shape breaks up the square edges. Tucking in some cheesecloth gives the effect of netting…a natural choice for a beach card. I love the texture it adds and helps to fill in the arrangement. The bow has white stitching and helps to break up the dark blue satin. Last but not least…..some coordinating Prills to give the effect of water. 1. The bare chipboard was wiped down to prepare for finishing. 2. Flat white acrylic to top off the scribble frame and gold to base coat the shells and sand dollars. 3. Crackle medium is added to the sand dollars and once dry a thin coat of white acrylic. Stamping on the frame and a bit of inking. 4. Distressing the edges makes the elements pop. 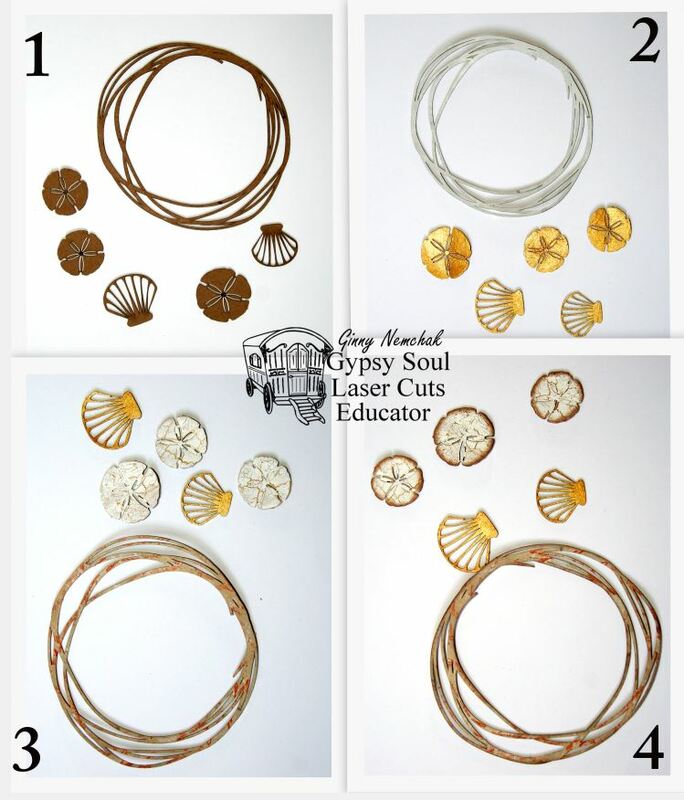 Gypsy Soul Laser Cuts~ Beach Shape Set, Scribble Frames and Lines. Hey there! 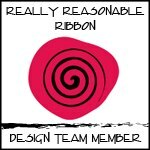 It’s time again for another fun challenge at Really Reasonable Ribbon. 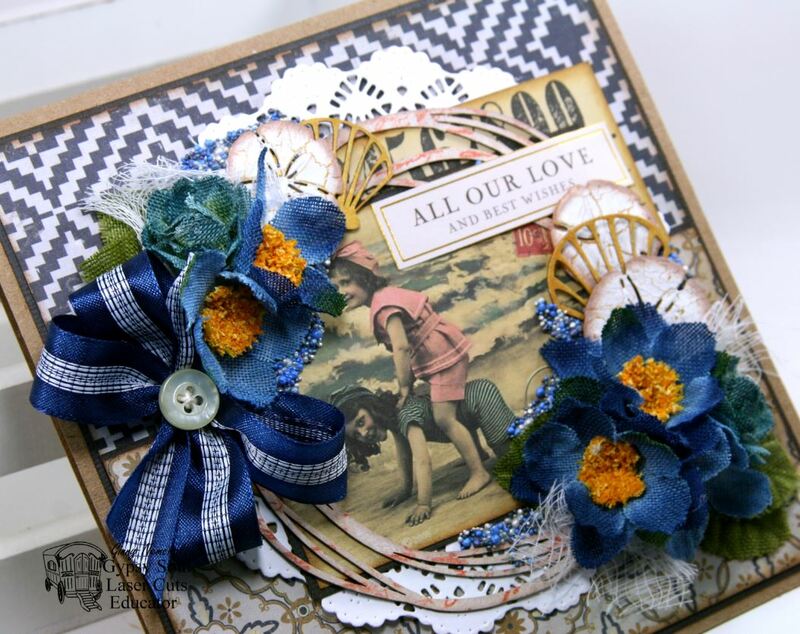 The theme this time is Anything but a Card with Ribbon or Trim. I’ve created a pair of fun and festive and very patriotic tags…..which are the perfect addition to any summer holiday home décor. I was inspired by these sweet little wooden hearts painted out with a chalkboard finish with a dash line edging. What a perfect base to add the embellies to. Of course you have to have a double layer bow and this one has itty bitty stars squeeeeeee. The sentiments are actually layered stickers. They have great dimension and a vintagy Americana feel. I used spacers to add extra depth and allow room to secure the twine that’s added to the tag. This tag is similar…but has a different sentiment. The base of this tag is 110 lb cardstock with a rich blue and polka dot pattern layered on top. The back is finished in a coordinating pattern. A double layer of doilies because you can never have enough of those…..along with matching flowers, pearly accents and iridescent stars. 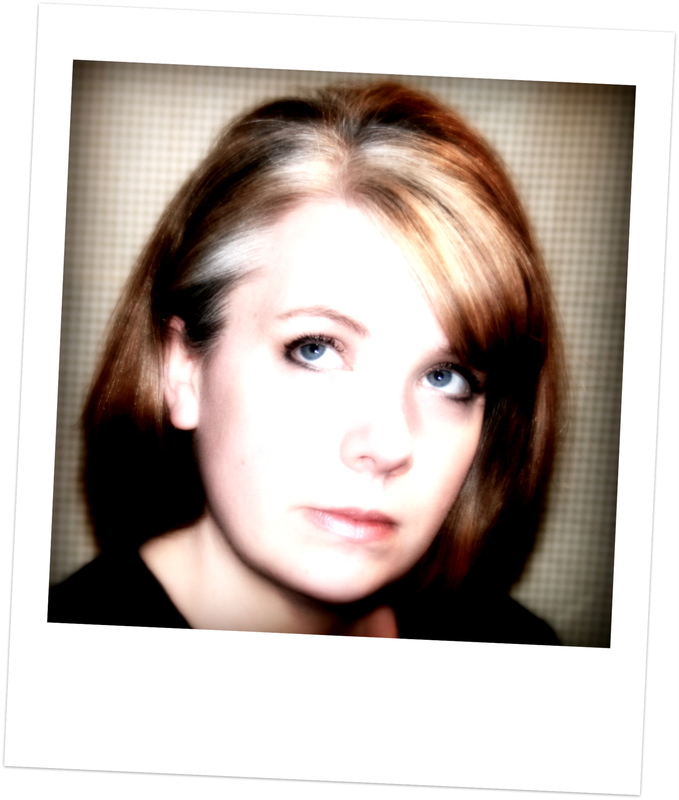 Last but not least…..extra squishy tinsel topped crepe fringe. Really Reasonable Ribbon~ Tiny Electric Blue Stars on Grosgrain, Shimmer Blue Satin. 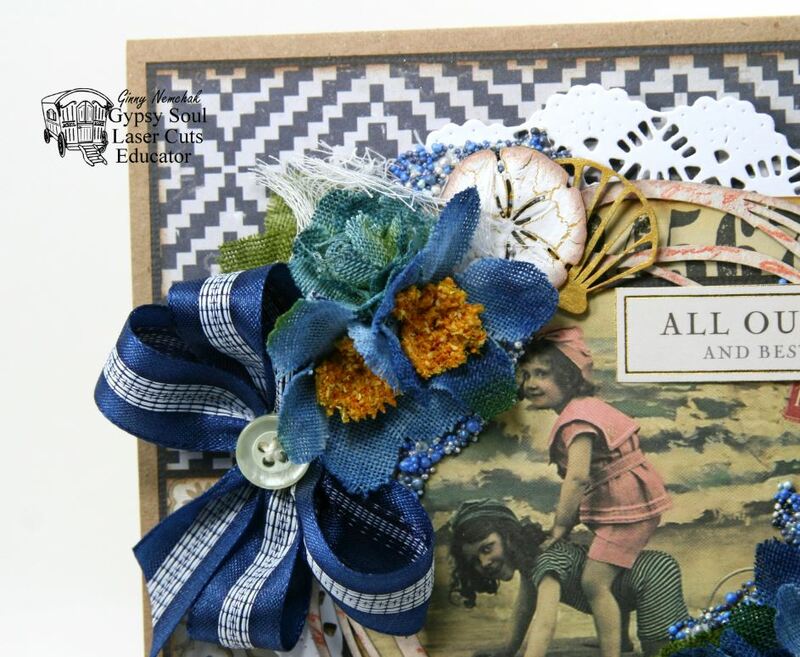 Okay now it’s your turn to create a fabulous project that’s Anything but a card with Ribbon or Trim and link up with us at Really Reasonable Ribbon to play along. Hey there Peeps! 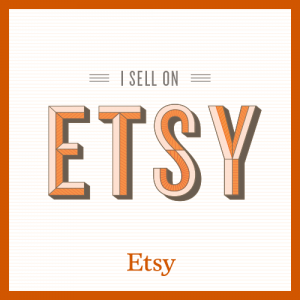 Just dropping in to share a sweet little framed wall hanging that I created with the new Serendipity collection from BoBunny. I had fun playing around with some mixed media supplies to create a great pattern and texture for the frame.